Silk was discovered by the musician Keith Sweat and Andrea Ryans. The group was originally a quintet made up of Timzo Cameron, Jimmy Gates, Jr., Gary “Big G” Glenn, Johnathen “John John” Rasboro, & Tyga Graham who was replaced by Gary “Lil G” Jenkins before they recorded their debut album. In 2002, Elektra Records Silk the label and took a hiatus. That same year, Jenkins went on to pursue other interests and made his stage debut in 2002 as ‘AJ’ in the Tyler Perry play Madea’s Family Reunion. He resurfaced musically in 2007 with his solo debut, The Other Side. In addition to being discovered by Keith Sweat, Silk and Sweat both appeared in the group, Black Men United on the track, “U Will Know” for the movie, Jason’s Lyric the film’s soundtrack. In 2003, down to a quartet, Silk released their fifth album Silktime, on their own label Silk Music Group. The album featured the songs “Silktime”, “My Girl”, “Alibi”, “More”, “You (The Baby Song)”, “Check My Story” and a cover versionof Blue Magic‘s “Sideshow“. That song reunited them with their mentor Keith Sweat. The album appeared in the Billboard 200. 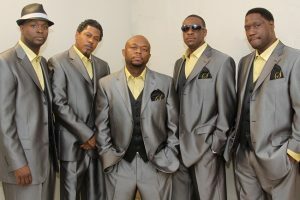 In 2006, the group returned with their sixth release, a cover album entitled Always And Forever on Shanachie Records. The album featured covers of R&B songs including “Adore” by Prince, “Always and Forever” by Heatwave, and “Secret Garden” by Quincy Jones. “Secret Garden” was the first and only single. Contrary to popular belief, Gary “Lil G” Jenkins has been reunited with Silk since 2008. In 2014, the quintet, composed of the original members who debuted in 1992, announced that their seventh studio album, “Day & Night” was in production.